The Wind Tunnel Building in Mont Lachat is now gone. Once upon a time there was an offending sight ruin located at “Col du Mont Lachat”, along the TMB railways (Tramway du Mont-Blanc) southbound to the Nid d’Aigle (Eagle’s Nest). But on Saturday October 3, 2015, a crew of officials, journalists, workers delegates and civil society representatives got together to celebrate the end of the rehabilitation work on the site and to see… the recovered emptiness of the site. This aircraft engines testing facility existed since 1937 ended its operations in 1969 and was sold to the city of Saint-Gervais in 1975. In its final state, the building was heavily damaged and did not present any architectural or historical potential. Mountain Wilderness and proMONT-BLANC had it already identified in their Mont-Blanc inventory of obsolete facilities from January 2000 and have militated for this rehabilitation since then. This was a heavy project, expected to last much longer than the one year it actually took thanks to the excellent cooperative action of all involved parties. It was not easy though, the site is located at 2017 meter elevation, has no access road and needed to be de-polluted of its asbestos and lead. About 2,260 m3 of concrete and various materials had to be treated, some of it, inert, was buried on site to fill the excavation resulting from demolition. 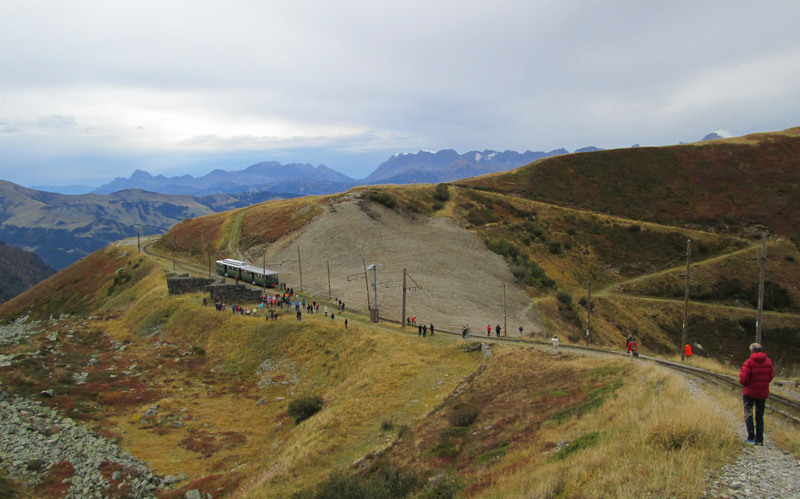 The remaining was evacuated by train, this was a logistics challenge for TMB (Mont-Blanc Tramway) to intertwine tourist trains with heavy material transport on its single track. In addition the surrounding has been cleaned of all wastes littering the area. On the financial level the operation has been “exemplar” according to Saint Gervais’s Mayor Jean-Marc Peillex: the WWF has provided €150 00 thanks to its Pandathlon event, the “Haute Savoie” department funded about 80 % of the project though a tax scheme for sensitive natural areas and EMB (Mont-Blanc Space), €10 000. Asters (an organization managing the natural spaces) has funded the seeds while “Compagnie du Mont-Blanc” supplied all transports means. The site is now returning to its original alpine lawn status. It will take 3 to 4 years to get to its final stage, about 30 types of seeds were collected and nurtured before being sown on the topsoil covering the new ground composed of granite rock mixed with building limestone.